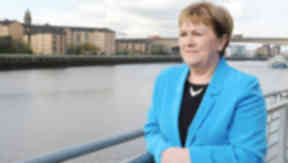 Johann Lamont launched an attack on the SNP as her party unveiled its Europe campaign. The upcoming European elections should not be seen as an extension of the referendum campaign, Scottish Labour leader Johann Lamont has insisted. She launched her party's campaign for the "important" ballot at a Glasgow college with the message that Labour MEPs could make a difference on "issues that really matter to people". When the SNP launched its Euro election campaign earlier this week, First Minister Alex Salmond said that Westminster representation in the European Union (EU) had "let Scotland down time and time again". Deputy first minister Nicola Sturgeon said Scotland needed both a "strong team of SNP MEPs" and a Yes vote in September's referendum to make its mark in Europe and "ensure that Scotland's interests are always defended". But Ms Lamont insisted the European Parliament elections on May 22 were "important in themselves" and should not be "a proxy for another debate". She said: "For the SNP, everything is an extension of the debate about the referendum, everything they do is about the referendum, Scotland is on pause - they're not making the big decisions on education, on economic opportunities, what we're going to do to support older people, because for the SNP everything is about getting over the line on September 18. "We're frustrated by that, but everything they do is about that, and we suffer as a consequence." The Labour leader continued: "It is no surprise to me that the SNP talk about these elections in terms of grievance, because their explanation for everything that is happening in Scotland is Westminster has been bad to them, of course they will say we get a bad deal out of Europe because of Britain." But she said while the Nationalists "define everything in terms of grievance", she claimed they were still "unable to explain is if we separate from the rest of the United Kingdom whether we will be in Europe or not". Ms Lamont stated: "I always think it's quite an irony that the SNP want to work in co-operation with the rest of Europe, they see the benefit of working together. "There is only one union they've got a problem with, the one with our neighbours in these islands." She said the "challenge" of the European elections was "to make that relevant for people" and added: "We're in Glasgow Kelvin College, which has benefited from European funding, we know that our Labour colleagues in Europe have been speaking about issues that really matter to people like zero hours contracts, jobs, workers' rights, about taking on the big, vested interests, whether it's in energy or mobile phones. "So, it does make a difference, so the challenge is to make that relevant for people and for people to realise how important that is. "It's really important people understand the importance of Europe. When you look at the evidence of what Europe working at its best can do, it is so important. "The way in which we stay in Europe and improve Europe is by getting a Labour government in 2015, certainly, but by having Labour MEPs who show what the job can do and the difference it can make." Labour currently has two Scottish MEPs, the same number as the SNP, while the Conservatives and Liberal Democrats have one each. But with the Lib Dems having suffered a decline in support since the last European elections in 2009, there has been speculation that they might lose their Scottish MEP in the upcoming ballot. Ms Lamont said Labour was "optimistic but also realistic" about its chances of upping its number of Scottish MEPs to three under the "difficult electoral system" in the Euro elections. She added: "Our optimism is grounded in how we have done, how we have improved and progressed, we weren't expected to do as well as we did in the local government elections in 2012, we've had very significant swings in by-elections and we're seeing in by-elections at a local level people again being prepared to put their trust in Labour. "We are out there fighting for every vote and we recognise that third seat is there for the taking, we will be fighting very hard to do that."